1 of 1 Heat oven to 350 degrees . Lightly spray a 13 x 9 x 2-inch baking pan with nonstick cooking spray. 1 of 1 In a large bowl, combine cake mix, egg and melted butter. Mix well until dry ingredients are moistened. Pat lightly into prepared baking pan, covering bottom and sides of pan. 1 of 2 In another large bowl, beat cream cheese until smooth. Add eggs and vanilla extract and beat until well combined. Beat in melted butter until evenly blended. On low speed, gradually beat in the box of confectioners sugar. Beat until smooth. 2 of 2 Spread cream cheese mixture over crust in pan. Bake for 40 to 50 minutes, until sides are set and center is still a little jiggly. Remove from oven and cool completely. 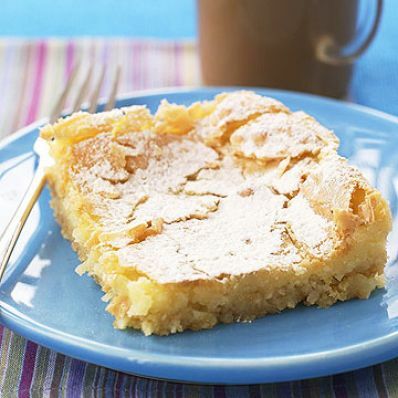 Dust with confectioners sugar and cut into 20 squares.